As the climax of Revenge of the Sith and the entire prequel trilogy, the duel between Obi-Wan Kenobi and Anakin Skywalker that concludes the film is placed under a great deal of dramatic weight. So how does a composer score a scene of such importance? At first, it may seem that John Williams’ accompanying music, titled Battle of the Heroes, is, like Duel of the Fates from The Phantom Menace, another example of climactic action music that is associated only with the duel itself rather than the characters involved in it. After all, like many action cues, the melody of Battle of the Heroes is somehow more ordinary than the typical character theme, and nearly its entire structure is built on the repetition of a single phrase of music, sometimes in varied form. Hear this in the scene below, from 1:39-1:46 and a common variation of it from 7:12-7:19. In the film music analysis below, however, a closer examination of this cue reveals relationships with several other themes in the Star Wars saga which together summarize how Anakin has fallen so deeply into the Dark Side that he now wants to do away with Obi-Wan, his former Jedi master. In short, these relationships raise the theme’s importance to a level appropriate for the trilogy’s conclusion. The second reference to the Vader progression occurs as Anakin attempts to leap over Obi-Wan despite his warning not to—in the clip above from 6:34-6:41. 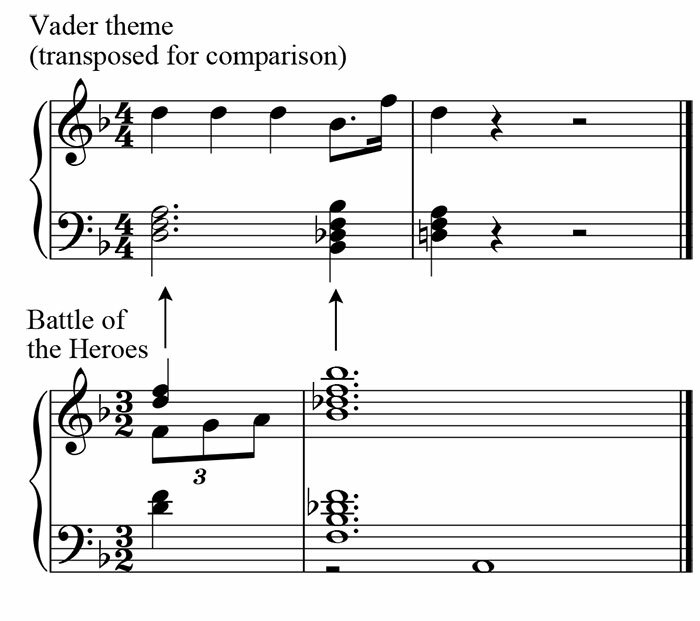 Neither of these Vader references is at all obvious, especially since the most recognizable feature of the Vader theme, its melody, is absent here. Instead, the references are mere suggestions, perhaps to more seamlessly blend several other thematic connections into the cue and demonstrate musically the many factors that have led Anakin to join the evil Sith. This similarity to Across the Stars is an apt way of suggesting musically that Anakin’s love of Padmé has played a key role in his downfall and turn to the Dark Side. Two other themes that the main melody of Battle of the Heroes seems to channel are two virtually interchangeably themes that describe Anakin’s relationship to his mother, Shmi. Significantly, these themes occur at points where Anakin is feeling or describing the emotional pain he experiences through his mother being apart from him, in trouble, or having passed away. This theme reappears twice more in the next film, Attack of the Clones, once when Anakin mentions to Obi-Wan that he cannot sleep well anymore because his thoughts dwell on his mother. It recurs once again in the same film when Anakin has found Shmi captured in the Sand People’s camp and unties her. Hear this in the video below. Hence, the themes referenced in Battle of the Heroes, subtle though they are, include Vader’s theme, Across the Stars, and two Shmi-related themes I call Anakin’s Love for Shmi, and Anakin’s Grief. None of these themes are projected with the clarity of a leitmotivic statement, but then, that is part of their effectiveness. Had they been parsed out and stated individually, they would have given the impression that their associations—whether it is Anakin and Padmé’s love, Shmi’s death, and so on—were being conjured up at a particular moment in the scene. Instead, these other themes are recomposed and transformed into a new theme, providing a musical parallel for the way that Anakin’s love for his mother and for Padmé have transformed him into a new being. Perhaps, then, the melodic ordinariness of Battle of the Heroes is in part an effort to allow these other themes to be referenced simultaneously, like how a person with rather neutral facial features can look like many different people at once. By subtly blending these references into Battle of the Heroes, the theme instead summarizes the main factors contributing to Anakin’s character trajectory through the prequels. In other words, the emotional pain he feels due to the separation from, and the torture and death of his mother led Anakin to fear that Padmé, like his mother, would die despite his formidable powers. In turn, this intense fear left Anakin susceptible to Palpatine’s manipulations of him and ultimately drove him to the Dark Side and to becoming Vader. All of these thematic connections lie beneath the surface of Battle of the Heroes, whose main purpose is to function as an action theme for the film’s climactic duel, a purpose it carries out rather well even without knowledge of these relationships. This is not to say, however, that the relationships are unimportant to the theme’s meaning. On the contrary, like the leitmotifs of a Wagnerian opera, understanding more about how the particular themes of a work are interconnected only enriches its meaning and thus heightens its importance and renders it a more integral part of the entire score. 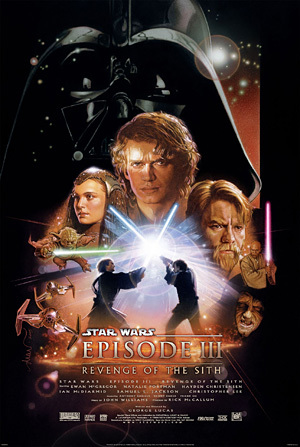 And in this case, it is particularly fitting that these rich narrative connections take place in a theme composed specifically for the battle that physically transforms Anakin Skywalker into Darth Vader, the narrative highlight of the prequels. While I loved the standout themes from the first two prequels (“Duel of the Fates” and “Across the Stars”), for some reason I don’t find “Battle of the Heroes” to be as engaging. It reminds me of Sibelius’s “Finlandia”, which seems to be to feel like it’s not finished, like it’s missing it’s climax or something. I just can’t put my finger on why I feel this way. Thanks for the analysis, I need to think about this some more. Once again, thank you for your analysis. It is always exciting discovering something new about a work that I yet listened many times. I never noticed the Anakin’s grief and Anakin’s love for Shmi motifs. I really like how you bind the different motifs together, and link them to the story. It makes me want to see (and listen) once again (to) the movies. I am eager to read your analysis of the Force awakens. Hi Mario. Thanks for your concern. This year it was sadly impossible for me to get the time to post about the Oscar race for Best Score. Everything is ok, just super-busy. Everything this year has been completely new for me in a new job and country, so it’s taken a whole lot of time to settle in and adjust to my new duties. I will return, though. My next goal is to write on The Force Awakens. I hope to get to it before summer. What had happened so far? Summer has come and gone, and a new summer is about to begin. I automatically read “high ground” in Obi Wan’s voice, in the same intonation he had when he said it.